It is the most common question I hear when talking with clients about the potential of social media…. Will we have enough to say and the time to say it? In practice, finding subjects to talk about is not as challenging as people sometimes imagine, but it still takes time to turn these subjects into content and there is always the danger of focusing on quantity rather than quality. Even Twitter and its 140 character limit benefits from tweets linking to more substantial content where quality is essential – though not always delivered! This graphic is neat but there is also another angle to the issue…. As with many things in business, a bit of planning can really help with content production but all too often, to meet their content needs, marketers simply focus on their own company stuff and write about themselves. Unfortunately, most readers aren’t bothered about the details of other businesses so does this make sense? What they are bothered about is their own business and taking it forward. Hey, isn’t helping your customers in their businesses something you know about? After all your business is focused on delivering benefit to your customers which should hopefully make you a bit of an expert in an area of interest to your customers – use that expertise! 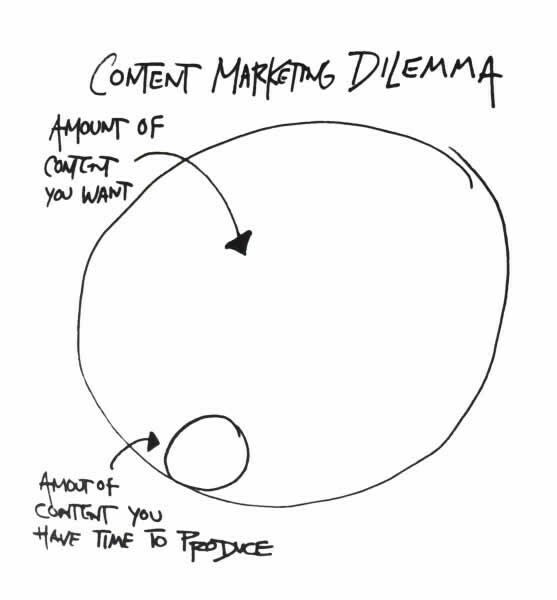 As I mentioned above, too many people go down the route of delivering high volume, low quality content, which interestingly presents an opportunity. Be different – use your knowledge to work through the rubbish and sift the nuggets of real interest. Become a Curator and build a name for yourself as someone who gets rid of the low quality content from your sector and feeds through the high quality so that your readers can jump straight to reliable quality. By becoming a curator you are gathering quality content from across your sector and packaging it to be easily accessible for your readers, and readers who see good, relevant, interesting content will want to come back for more! I said earlier that some people become over-focused on their own content but if you become a committed curator, there is a danger of going too far the other way and never mentioning your own stuff! Mix mixing your own content in with your curated content you can create a great balance where the marketing messages you want to communicate are framed by strong, sector-relevant information attractive to readers. 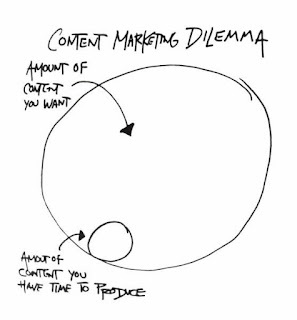 As a guide, a ratio of 4:1, Sector Content:Your Content, is a good objective. If you hit the 4:1 ratio it means that you only need to create 20% of your content from scratch so maintaining a quality feed becomes much easier as your 80% curated content is based on the work of others where you simply select the best bits! The end result is better content, easier to deliver and with your business at the heart, a great way to communicate your message and build your brand. If you want to find out more about content curation, check out this great post from relevance.com – or give me a call….